While the team behind The Cove, the hidden-camera documentary about dolphin slaughter in Japan, was in Los Angeles last week accepting an Oscar for Best Documentary, it took a detour to help carry out another undercover sting operation  this time at a Santa Monica sushi restaurant. Together with federal officials, the team members discovered evidence that a restaurant called the Hump  really  was secretly serving whale meat, in violation of the Marine Mammal Protection Act. When confronted, the restaurant accepted responsibility for serving whale, and now faces a fine of up to $200,000. As Andre Birotte Jr., a U.S. Attorney on the case, told the New York Times, "Someone should not be able to walk into a restaurant and order a plate of an endangered species." Which leads to the question  who would possibly eat whale meat? In June 2005 I attended an annual whale-tasting event held by the Japanese Whaling Association at the national legislature in Tokyo. Restaurants from around Japan served their best cetacean recipes  whale sushi, whale sashimi, whale on crackers, canned whale, whale with Osaka noodles  to black-suited Japanese legislators, who grazed from one table to the next. So I had to try it. When you cover a whale-tasting event, you have to taste whale. And morality aside, I can tell you that whale meat isn't good. As sushi and sashimi, it was fatty and chewy with a bland, blubbery taste  like salmon that's been kept out too long. The one exception was the whale noodle dish, but I'm going to say its success had more to do with the noodles and spicy broth than it did with the whale. All in all, the experience made it hard for me to keep a straight face when people referred to whale as a "delicacy." It was like eating leftovers from a submarine. 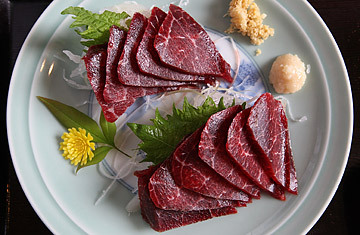 Indeed, even in Japan, whale meat isn't that popular. Though some coastal towns have hunted whale for centuries, relatively few Japanese ate whale regularly before the postwar years, which is when it took off. What changed? Blame U.S. General Douglas MacArthur, head of the U.S. occupation of Japan, who thought whale meat would be a cheap source of protein for an impoverished country and effectively launched the modern Japanese whaling industry. A generation of Japanese schoolchildren grew up accustomed to having whale in their lunch boxes. But it's been decades since Japan could be described as impoverished, and a 2008 survey found that 95% of Japanese either eat whale meat very rarely or not at all. The fishing company that owns Japan's whaling ships estimated that annual per capita consumption from its catch might amount to less than four slices of sashimi a year. If Japanese whaling  which is allowed under the international ban only on a very small scale, as "scientific research"  ended tomorrow, your average salaryman in Osaka would barely notice. And yet the whale wars continue  and even seem to be worsening. In January a vessel belonging to the Sea Shepherd Conservation Society, a group that tries to disrupt Japanese whaling on the high seas, was badly damaged in a collision with a Japanese whaling ship. On March 12, the Japanese Coast Guard in Tokyo arrested Peter Bethune, a member of Sea Shepherd, after he tried to board a whaling ship without permission in February. Yet Sea Shepherd  the subject of the popular Animal Planet reality show Whale Wars  isn't holding back. "Nothing is going to keep us from trying to save whales," says Laurens de Groot, a deckhand on a Sea Shepherd vessel. "We're not going to stop." But neither is Japan. In part, the Japanese may be protecting their right to whale as a stand-in for a separate issue they actually care about: fishing for bluefin tuna, which is popular in sushi. The Japanese eat an estimated 80% of the world's catch of the species, which many scientists believe is in danger of being fished out of existence. If Japan holds the line on whaling, the argument goes, it would send a signal that limits on bluefin tuna aren't up for debate either. We'll see if that message gets through. At the meeting of the Convention on International Trade of Endangered Species, beginning on March 13 in Doha, the E.U. and U.S. will push for a ban on international trade of the bluefin. Japan has already said it would oppose the ban, but Tokyo faces an uphill battle. "A ban is the only possibility to prevent a total collapse of this species," says Sergei Tudela, Atlantic bluefin tuna expert for the World Wildlife Fund. But there is more than just fish politics and food culture at stake for Japan when it comes to whaling. Even though few Japanese ever sit down to a plate of whale sashimi, they still resist viscerally the idea that the international community could force Japan to stop whaling. A country that arguably never returned to full sovereignty after World War II  its constitution greatly limits its military, and U.S. armed forces are still based throughout Japan  can get tired of the world telling it what to do. As a Japanese chef told me at that whale festival in 2005, "If other people don't want to eat whale, that's fine. But we should be allowed to do what we want." A side of national pride makes a blubbery dinner go down a lot easier.